We’re on a roll…2 marathons down and 2 runners willing to write a guest blog. I don’t know about you but I love reading race recaps. I feel as if I’m right there in the moment. On a cold New Year’s Day run with my friends Jen and Becca, the subject of fall races came up. Jen mentioned that registration for her home town race, the Detroit marathon opens today and is half price for the first two weeks of the year. I had it in my head that I wanted to do a fall marathon this year and with the low price and the option to transfer my registration should I not be able to do it I said “why not?” I also knew I wanted to do a race up north in the fall to avoid the warm temperatures that still linger at that time in the south. My ideal racing weather is upper 40s and sunny. Detroit as a city gets a bad rap. Some of it deserved some of it not. The marathon is well run, but the expo has outgrown its current conference area and needs to be expanded and reorganized. You are required to wind your way through all the vendors in order to get to packet pick up. This would not have been a problem except that all the people who had already picked up their packets were going back through the same area making it very crowded. I got my green bib that signified that this was my first marathon and then made my way to do some necessary shopping. 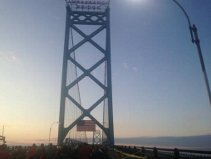 The Detroit marathon is international, meaning you start in Detroit and run across the Ambassador Bridge into Windsor Ontario and then back through the tunnel to Detroit; you are required to give your passport information when you register so that you can be pre-cleared by immigration. They say that it’s not policy to stop runners during the race, but to have your passport on you in case something happens. In this era of running post the Boston bombings I decided that I would rather be safe than sorry so I purchased a Roo Sport magnetic case that was big enough for my passport to fit in since the pouch on my Nathan belt wasn’t large enough. I also picked up some Brooks pink arm warmers and a finisher shirt. I figured if the worst happened and somehow I didn’t finish I could cross it out ‘finisher” and write “carried away in an ambulance” at the Detroit Marathon. The Westin book Cadillac is a nice hotel that is only two blocks away from the start line. They had special keys and door hangers made for the marathon guests. The lobby Sunday morning was filled with runners all hyped up on Gatorade, bananas and adrenaline. I was with Jen, her sister Jessica, brother in law Mike, and their high school friends, Shauna, Melissa, and Brad who were all running the half. We went out into the cold and the two blocks to the start corals. This was the first race ever that I didn’t drive so I have to say that staying near the start is an excellent idea. I was one of four from our group assigned to Corral M. M for is the last runner corral with the final two being reserved for the power walkers. We weren’t paying much attention to the countdown to the actual start of the race since we knew our coral wouldn’t start for almost 30 minutes, but couldn’t help but notice when the race DJ played “Lose Yourself” by Eminem. This is analogous to starting the New York Marathon with “New York, New, York.” It fits. As we moved up the corrals we had to be careful where we stepped because it was clear that some horses had done their business in the street, at least we were pretty sure it came from a horse. If not eww.. We also had to be careful not to trip on the piles of shirts that had accumulated in the center of the road. The buildings and crowds of people had shielded everyone from the wind making it not too cold and runners wanted to get rid of their throw away shirts before they crossed the start line to comply with the announcers request that they be able to see our numbers. When it was finally time for our corral to start, we all started to get a little emotional. Jen provided hugs to each of us and I tried not to cry. Before I knew it corral M was off and running. I watched as the others speed up to stick to the 5:30/2:45 pacer and I hung back and settled into my 13 min/mile run walk pace. I would have liked to have been with them longer, but this was my plan and my race. For better or worse it was mine to run alone. I did my best to do the walk portion as fast as I could. I am not a naturally fast walker, but I was trying to make up for the weakness of my hips with strong arm movements to propel me along. I did speed up a little in those first couple of miles to get away from a runner who fastened a cow bell to his running belt. I checked by heart rate and it was around 160 so I felt good and relaxed. That was my whole mantra in the beginning, to run relaxed. I told myself that these first miles should feel easy. I made my way to the border crossing a little before sunrise. It was actually my first time going into Canada. I had been near the border several times but had never had any real reason to go across. The border patrol was mostly friendly and a few of them have high fives. The largest hill of the day is was the winding highway on ramp to get on the Ambassador Bridge and then I had to tackle the long slope of the first half of the bridge. Lots of people were stopping to take selfies on the bridge. I did take a picture during a walk break though. At the end of the bridge there was a DJ welcoming us to Canada, “home of hockey, curling, and free health care” I’m not sure where in Canada he was originally from, but it was amazing how Canadian his accent was for being right on the border. I made my way off the bridge and skipped a walk break because I thought I might go ahead and take a porta potty break. I didn’t need to go too bad, but I could tell that I would have to make a stop eventually because I had a large Gatorade in the start coral. There were a ton of pota johns after the bridge, but there were also a ton of people waiting. I told myself that would be fine to wait and moved along. I also started to feel some discomfort in my right foot, but it subsided after a walk break. The road on that side of the border is right along the river next to the Veteran’s park. It was nice and scenic, but it got a tad chilly because of the wind. The crowds were still very thick as we passed the 1st relay hand off. After a couple of miles in Canada it was time to wind our way up to the entrance to the tunnel. It was loud throughout this art with various DJs and the crowd. Two of my walk breaks were about 2:30 min instead of 1:30 min because I couldn’t hear the beep! The tunnel was my least favorite stretch of running. It was muggy, crowded, and dark. The satellite reception goes out in the tunnel; I bought a Garmin foot pod so that my distance would be recorded during this section of the race. I’m not as much as a slave to my Garmin as I used to be, but having the foot pod alleviated a little mental pain, and the last thing I wanted to do was to have something small like a missing Garmin mile get in my head. Lots of runners were stopping to take pictures of themselves at the border. I was not going to spend any more time in the tunnel and even subconsciously picked up the pace for the whole mile through there. After leaving the tunnel I was greeted by the best spectator crowd of the day. There were lots of signs and well wishes. I actually got one “Go Star” through there. The next several miles passed quickly as we ran towards the iconic GM tower. As we neared the marathon/half marathon turn off there were several tailgate parties going on for the Lion’s game that started at 1. Detroit is a little like St. Jude is that the half has about twice the participants as the full, so it did feel a little lonely as all but a handful when straight as the halfers headed for the end. Things felt a little fuller as we started to pick up the slower runners who were only running the second half. Detroit has a US inly half marathon that starts 3 hours later on the second half of the course to accommodate those who can’t get clearance to pass into Canada. On my forth fueling I grabbed a honey stinger gel. I had used them plenty in training, but primarily I use hammer gel that I put in a flask. It just only holds 6 servings so I knew I would need at least one other one for the race. For whatever reason it didn’t agree with me, it burned and it also made me slightly queasy. Around the next turn was the first group of porta potties without a line so I decided to go ahead and make my one and only stop. The next several miles were slightly lonely, but it was broken up by a high school marching band and a white guy with a ginormous ‘fro paying the saxophone. Both feet were starting to really feel the pounding they had been taking. At mile 16 we entered the Indian Village neighborhood, which was my favorite party of the race. It’s a bit like Central Gardens as it has stately older homes one gorgeous tree lined streets with really fun residents playing music, cheering us on and handing out beer and candy. The only downside to Indian Village was that I was starting to get slightly behind pace. After exiting Indian Village we made our way to Belle Island. This was one of my least favorite parts of the race. Belle Isle is pretty, but there was virtually no crowd support and the volunteers were starting to look a little tired. My feet were killing me and I was trying very hard not to fall behind pace. Once I left Belle Island there were just over 4 miles to go, aka 2 miles till Jen was meeting me and running with me towards the finish. The police made us get on the side walk for a bit which I thought was kinda of bogus since I was 45 minutes ahead of the course closing for that area. I even had to dodge a woman with a shopping cart. With three miles to go one of the guys around me said the dreaded words, only a 5K left. If I got a dollar for every time I heard “almost there” in those last 3 miles I could have paid my entry fee with it. With two miles to go I was at the end of the Riverwalk section and saw Jen waiting for me. She gave me a little extra oomph to finish strong. As bad as my feet were hurting the mental fatigue was what was really slowing me up. One last water stop, and then something annoying happened. A cop made us stop at a light, ugh! You had to me kidding me! It wasn’t all that long, but since I was so close to finishing below my stated 5:45 goal time. I only took about 30 seconds of the last walk break one with about .4 miles to go. I don’t remember what I was feeling at the final yards and crossing the finish. I just remember finally feeling that it was really done when a volunteer handing me by tub of hummus told me that it was over and I had finished. I clung to my Mylar blanket and walked to the finish area. I ended up finishing within a minute of my goal. It really is a great feeling to me a marathoner. In the airport on the way home Jen and I saw a group of women wearing there Nike Women’s Marathon finisher shirts. Those will hopefully be me next year. In the meantime on to the St. Jude HALF. Way to go, Amanda!! We loved tracking you and what a great race! Your pace was perfect and you got that goal 🙂 I loved reading this post….really makes me want to run this race!